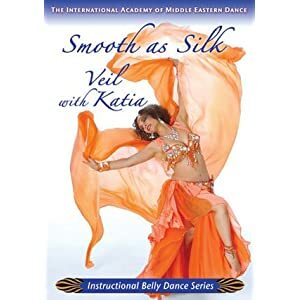 This DVD has "silk" in the title for a reason - it's specifically about how to work silk veils. They handle very differently to chiffon and organza, because they're usually much lighter and catch the air differently. There are some great moves in this tutorial and Katia gives them some fun names, including the Phoenix, the Orchid, the Funnel, the Geyser, the Grecian Urn, the Surge, Swing, Sidewinder, Cloud, In the Waves, Venus, Cyclone, Loop-de-loops, Spirals, Wave Walks, Outburst, Melt Down, Sky Scraper, Whip, Hoop, and the Crazy Eight . My only complaint is that she teaches with an extra long veil, and some of the moves aren't suitable for a standard veil, even a silk one.